There’s a new West Coast vibe next to the White House. Born and raised in the Bay Area, I grew up loving Peet’s Coffee & Tea and declare myself a proud “Peetnik.” Trips to the original store in Berkeley were a staple. Its emphasis on offering a wide variety of coffees and teas lets the customer explore more options than at other commercial coffee chains, even Starbucks. In California, where the chain was first established almost 50 years ago, Peet’s Coffee & Tea are just as common and popular as Starbucks. The two coffee shops each have a loyal customer base that defends their preference as superior, creating a divide and constant debate. Peet’s represents the best of both independent cafés and corporate coffee behemoths, feeling like a unique and cozy coffee shop while making its famous drinks easily accessible across the country. Just like you’d want in any coffee shop, it provides the perfect atmosphere for studying or meeting with friends while enjoying delicious drinks and freshly baked pastries, like Rice Krispies Treats and a variety of muffins. The blended Freddos, which are Peet’s take on the Frappucino, are a must-buy because they are much smoother than their Starbucks counterparts. My favorites are the matcha green tea Freddo and classic coffee options such as iced coffee and latte macchiato. Generously sized cookies and mouth-watering breads are great additions to any of their drinks. 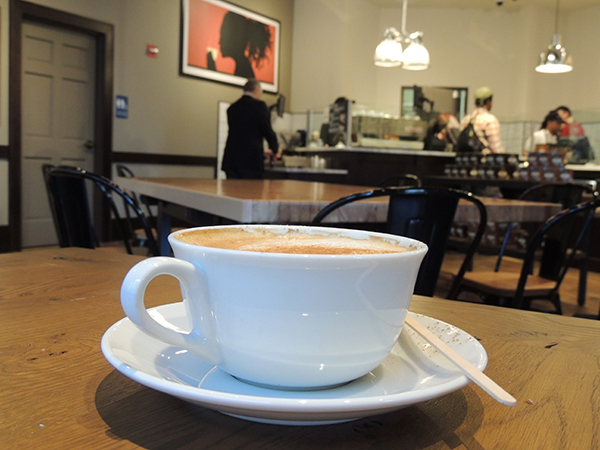 Peet’s flagship store in D.C. offers the same menu and vibe that makes it so enjoyable in California. Yet the latest location also offers something original, establishing a new chapter in Peet’s expansion. The company’s stores each differ, with atmosphere changing to reflect its location. While it’s original location is more cozy and filled with different memorabilia reflecting Peet’s history, the new D.C. location establishes a more professional vibe. The café includes lounging space and high ceilings, with room to work and relax. A large communal table in the middle of the store, repurposed from an old bowling alley lane, provides extra seating. The space marks the first store-opening in the District for the company, which plans on building 23 more stores around the city. Completely redone since Caribou Coffee’s cabin-like atmosphere departed in February, the West Coast brand’s new location has a more sophisticated ambiance. Walnut flooring and minimalistic chairs and tables open up the space, replacing the wooden paneling and leather sofas found at Caribou. Custom-made collages, featuring Instagram photos from D.C. locals, pay tribute to customers and the District. And because it is just a short walk from GW’s campus, Peet’s gives students another coffee source that isn’t Gelbucks, although it may be just as busy for the first few weeks.